This wine is very dry, a wine of high density and pronounced aroma. Its rich colour is a deep dark red and it has a delicious flavour of cherries, red berries, and plums with decent, very smooth tannines. 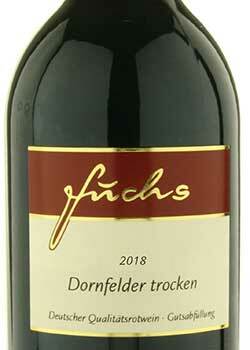 Dornfelder dry is a delicious all-rounder that can be enjoyed with meat, venison, pasta, cheese, and spicy dishes.